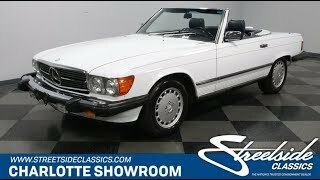 Hi, I am interested in your 1987 Mercedes-Benz 560SL (stock #5093-CHA) listed on Autotrader for $47,995. I'd like to get more information about this vehicle and confirm its availability. This 1987 Mercedes-Benz 560SL is a carefully-owned low-mileage classic finished in the best of European luxury motoring traditions. So look over the loaded features and essential documentation that reveal the best of the breed. Arctic White is a timeless color, and so its the ideal factory shade for a vehicle that has matured as nicly as this example. Averaging less than 900 miles annually means you know this one only came out of the garage on special occasions. Its why the paint has such a deep gloss and the body panels still hang with precision. So while all 560SLs were born with pedigree, this example makes sure to continually command respect with its exceptional condition. You see this preservation in the details, too, including the shining but subtle brightwork, two-tone pinstriping, and the pliable black rubber strip that contrasts the white while hugging the whole body. This example comes with both tops. That means a distinctive blue folding roof that secures into place in seconds and fits with precision. And for true refinement, the color-matched hardtop gives this a coupe-like profile. Of course, an SL like this is really most distinctive when its open to the world. So the hardtop fits onto the included stand, and the soft top disappears completely into its own well. Now youre ready to show off the fantastic blue leather interior. With such low mileage and such good care, this is an exceptional personal luxury machine. That also means a long list of luxury features, including power windows, power locks, and the Becker Grand Prix AM/FM/cassette stereo. This is a modern classic, and so you also get modern safety features like the third brake light and driver airbag. And because you want to stay comfortable with the top down, youll appreciate the cold-blowing air conditioning in the automatic climate control. Under the hood is the original 5.6-liter V8 motor. This fuel-injected motor looks fantastically correct, right down to the factory decals. That means you have a strong powerhouse that has been maintained to uphold the stout reputation of Mercedes-Benz. This is a true grand touring machine, because the sweet V8 is mated to a smooth four-speed automatic transmission with overdrive. Plus, with power steering and a well-balanced fully-independent suspension, this is the classic youll love to drive. The sale comes with all the right paperwork, including the original warranty card, maintenance records, title documentation, service manuals, and owners manual packet. It all proves this is the superior upper-class classic thats ready to take home today. Call now!